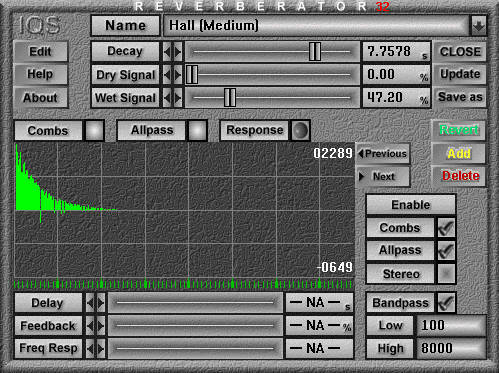 The Studio Reverb algorithms used incorporate the same Comb/Allpass filter design found in many high quality rack mounted reverb devices, but the Studio Reverb takes this design to the max. You'll have up to 20 Comb Filters and 20 Allpass Filters, with Hi Frequency Diffusion control in each Comb Filter feedback path and a high quality sharp cutoff Bandpass Filter on the overall wet output, truly rivaling the more expensive rack devices in sonic quality! Choose one of the many preset chambers (including High-Density presets) or edit and create your own. The edit mode gives you complete control over every parameter involved in the design. A beautifully crafted interface gives visual displays of each of the Comb and Allpass filter parameters and a powerful Response View will actually display a real calculated impulse response of your chamber settings. You can control the Dry and Wet mix as well as the Room Decay time for each of your selected chambers. The Studio Reverb also adds a stereo enhancement feature to simulate stereo ambiance when using mono signals, greatly expanding the audible reverberation effect. Patch the Studio Reverb into a return track and use the power of the built-in Aux Sends to send dozens of tracks to a single reverb. Having reverb control available directly within the MultiTrack eliminates the need for external reverb devices and allows incredible control over room ambient effects within your mix!